Transportation expenses could eat up huge part of your allowance or monthly pay check. This is one of the areas you could easily reduce and can yield big savings right away. 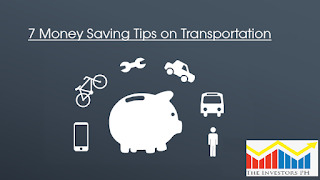 There are lots of easy ways to save money on transportation. Here are some few tips you would want to consider. Taking bus or train is a cheaper alternative than taking your own car. You can reduce your gas consumption and plus you will avoid parking fees that can be expensive. If your car is use less often, this would also help your car to stay in good condition and you can save from lower insurance premium and maintenance cost. Do you have friends or workmates that brings their car to school or work, or the other way around? You might want to consider car pooling. Share a ride and both can save from it. The driver can lower his fuel expense as much as 50% while the rider can save few cash from expensive taxi ride. With the technology now, you can book a sedan or a taxi to pick you up. There are applications you can download to avail this type of service. In the Philippines, the popular transportation apps are Grab and Uber. Most of the users of these apps find it not only convenient but a safer means of transport especially for those commuting at night and to avoid being ripped off by the cab drivers. However, remember it can either help you save money or increase your transportation expenses. To save some, avoid using these services at rush hours as the rate can surge from 150 to 300%. Regularly check for promo codes and use it when you book a ride. You can confirm promo codes on their Facebook page and Instagram account. You can also search promo codes via Twitter, for example just key in “grab car promo code” in the search bar. You can also invite your friends to use these applications and earn yourself a promo code. This is a cheaper alternative than bringing a car because it has lower fuel consumption. Motorcycle is widely use in countries like Vietnam and Indonesia. This mode of transportation is also becoming popular here in the Philippines. Remember to always use safety gears such as helmet before riding one. It is better to be safe and avoid medical expenses due to accidents. No gas and parking expenses. This is not only cost effective but also helps you keep a healthy body. A 20-minute bike ride can burn as much as 100 calories. Riding a bike to work, as part of your daily exercise routine, gives your body a complete workout. Check the places around your community as there are free parking spaces or other offers a onetime parking fee like Zuellig Building in Makati which encourages office workers to take their bikes to work. If your destination is just 500 meters away, just walk. Another easy way to avoid transportation cost and also a good means of exercise. Think of it as a workout routine – saving money while burning calories. Isn’t a good deal? For car lovers, you can also save through proper maintenance and efficient driving. Keep your tires properly inflated in order to help maximize your mileage. Have your oil changed and engine tuned up on scheduled. You will save a lot from unexpected expenses when car problems occur. Plan your route ahead this will avoid unwanted fuel usage. Avoid heavy traffic - Use navigation apps like Waze. Share this to your friends and family! Helpful tips! I would agree on the importance of saving. My personal tip would be budget your salary every month and make sure to save at least 20% or 30% of your income. Wow, great tips. We have so many option if we want to save and squeeze our budget. The money you can save in transportation can accumulate an amount we can start investing to stocks or mutual fund. Tipid tipid din para sa ekonomiya. Time to start saving. Especially for my upcoming projects and trips. Thank you for this article and the vital insights. Great tips to save some hard-earned $$, not to mention healthy, too. If one could walk and bike instead of riding all the time, he'd get the exercise his body needs to be in shape! Thanks for sharing. I commute by Jeep and trike plus walking on my way to work everyday! Nice tips. Of all, if the distance is not too long, I'd prefer to walk. That way, a bit of exercise is done while on the way to the destination. Always take the stairs hehe. Thanks for the tips. Even if I know how to drive and my parents are practically giving me a car, I still prefer to take public transpo or walk to places. It's cheaper and less stressful. I don't have to worry about the traffic. Hehe. I think I have tried them all except the number 7 since I do not have my own car!. These are indeed useful and I can really testify that doing such things can really save you a lot of bucks. Walkin and ridin a bicycle are really great alternatives not just to save money but it will also keep your health in good shape considerin how much calories you can burn by doing them in a regular basis! Thanks for the tips. Walk is the best way to save money. Thanks for the tip. If I'm not using a car, it's either I walk or take public transpo. I love biking but I want to reduce the risk of dying early or get seriously disabled for that :). Wow! You are very thoughtful. I often tried to save transportation costs,but failed. This time I think I won't fail. Your personal circumstances will dictate how successful you are when it comes to getting the cheapest rates of interest, if you have an excellent credit rating then you are able to get the best insurance promo codes deals on interest rates while if your credit rating is bad you will have to pay higher interest rates, even if you can get a loan.